Steroid receptor coactivator 3 (SRC-3) is a transcriptional coactivator that interacts with nuclear receptors and some other transcription factors to enhance their effects on target gene transcription. We reported previously that SRC-3–deficient (SRC-3−/−) mice are extremely susceptible to Escherichia coli–induced septic peritonitis as a result of uncontrolled inflammation and a defect in bacterial clearance. In this study, we observed significant upregulation of SRC-3 in colonic epithelial cells in response to Citrobacter rodentium infection. Based on these findings, we hypothesized that SRC-3 is involved in host defense against attaching and effacing bacterial infection. We compared the responses of SRC-3−/− and wild-type mice to intestinal C. rodentium infection. We found that SRC-3−/− mice exhibited delayed clearance of C. rodentium and more severe tissue pathology after oral infection with C. rodentium compared with wild-type mice. SRC-3−/− mice expressed normal antimicrobial peptides in the colons but exhibited delayed recruitment of neutrophils into the colonic mucosa. Accordingly, SRC-3−/− mice showed a delayed induction of CXCL2 and CXCL5 in colonic epithelial cells, which are responsible for neutrophil recruitment. At the molecular level, we found that SRC-3 can activate the NF-κB signaling pathway to promote CXCL2 expression at the transcriptional level. Collectively, we show that SRC-3 contributes to host defense against enteric bacteria, at least in part via upregulating CXCL2 expression to recruit neutrophils. The attaching and effacing (A/E) enteric bacteria enteropathogenic Escherichia coli (EPEC) and enterohemorrhagic E. coli (EHEC) are human-specific pathogens and do not cause relevant disease in animal models (1). These bacterial pathogens cause global diarrheal disease and other severe complications in humans, especially among infants and children (2–4). Citrobacter rodentium, a natural A/E pathogen of mice, uses virulence strategies similar to those used by EPEC and EHEC to infect cells, so it is widely used to model human infections with EPEC and EHEC (5). Upon infection, C. rodentium can colonize the murine cecum and colon and displace the commensal flora, which leads to intestinal inflammation characterized by mucosal hyperplasia, goblet cell depletion, and epithelial layer disruption; however, it is eventually cleared from the cecum and colon of C57BL/6 mice in 3–4 wk (5). C. rodentium infection induces infiltration of immune cells within lamina propria. Innate and adaptive immune systems are involved in eradicating C. rodentium infection. Studies of C. rodentium infection in immunodeficient mice established that neutrophils are required for early innate immune protection against C. rodentium infection (6, 7), and inflammatory monocytes are important in promoting bacterial eradication in the intestine (8). Intestinal monocytes and macrophages are required for initiating adaptive immune responses to C. rodentium (9, 10). The adaptive immune component, the CD4+ T cell–dependent IgG response, plays an essential role in clearing C. rodentium infection (11). Additionally, nonhematopoietic cells (e.g., intestinal epithelial cells) can also orchestrate the immune responses against mucosal bacterial infection (7, 12–14). Cathelicidin from intestinal epithelial cells, as an important component of innate antibacterial defense, can protect mice from C. rodentium infection (15). Another type of nonhematopoietic cell, goblet cells, can produce Muc2 to protect mice from C. rodentium infection by limiting tissue damage and translocation of pathogenic and commensal bacteria across the epithelium (16), suggesting that goblet cells are a critical innate immune player in the control of C. rodentium infection. Therefore, hematopoietic cells and nonhematopoietic cells are critical for the control of C. rodentium infection. Steroid receptor coactivator 3 (SRC-3) is a transcriptional coactivator that interacts with nuclear receptors and some other transcription factors to enhance their effects on target gene transcription (17). It was reported that macrophage SRC-3 could enhance LPS-induced expression of proinflammatory cytokines (18). In contrast to this study, our previous study demonstrated that SRC-3−/− mice produced significantly more proinflammatory cytokines and that macrophage SRC-3 could inhibit cytokine mRNA translation in response to LPS challenge (19), indicating that macrophage SRC-3 can protect mice by regulating the proinflammatory cytokine balance in LPS-induced endotoxic shock. We also reported that SRC-3−/− mice were more susceptible to E. coli–induced septic peritonitis as the result of an overwhelming uncontrolled inflammation and a defect in bacterial clearance (20), suggesting a critical protective role for SRC-3 in the host defense against bacterial infection. However, its involvement in host defense against A/E enteric bacterial pathogens remains poorly defined. In this study, we found that SRC-3 was expressed in colonic epithelial cells and was upregulated in response to C. rodentium infection. In light of these results, we hypothesized that SRC-3 plays a protective role in C. rodentium–induced colitis. We tested this hypothesis by comparing the response of SRC-3−/− mice and wild-type mice to C. rodentium challenge. We found that SRC-3−/− mice exhibited delayed clearance of bacteria and more severe tissue pathology after oral infection with C. rodentium compared with wild-type mice and that SRC-3 may contribute to host defense against C. rodentium, at least in part by upregulating chemokine CXCL2 expression to recruit neutrophils. SRC-3−/− mice (on C57BL/6 × 129Sv background) were generated as described previously (21). Wild-type mice served as controls. Six- to eight-week-old female mice were used in all experiments. Animal experiments were approved by the Laboratory Animal Center of Xiamen University. C. rodentium strain ATCC51459 was inoculated into Luria–Bertani medium and cultured in a shaker for 12 h at 37°C. Mice were inoculated orally with 0.2 ml of PBS containing 9 × 108 CFU C. rodentium after fasting for 8 h. The number of live bacteria was determined by serially diluting and seeding on a MacConkey agar plate for 18–24 h.
The distal 0.5-cm piece of colon tissue and feces were weighed and then homogenized in a Tissuelyser-24 for a total of 6 min at 30 Hz at room temperature. Tissue homogenates were serially diluted in PBS and plated in triplicate onto MacConkey agar plates. C. rodentium colonies were identified as pink colonies after 18–24 h of incubation at 37°C. Spleen and liver colonization was assessed as described for colon specimens. The detection limit of the CFU assay was 103 CFU/g of feces or colon and 102 CFU/g of spleen or liver. Mice were sacrificed at various times. Entire colons, spleens, and livers were removed under sterile conditions. The distal 0.5-cm piece of colon tissue was collected in a 1.5-ml microtube containing 1 ml of PBS. The adjacent 0.5 cm was fixed in cassettes in 10% neutral-buffered formalin. The next 1 cm was stored in TRIzol Reagent (Life Technologies) at −80°C for RNA extraction. The protocols of Siegmund et al. (22) and Gibson et al. (23) were modified. Briefly, segments of the mid-parts of colon were cut longitudinally and cleaned with cold PBS containing 100 U/ml penicillin and 100 μg/ml streptomycin. Then these pieces were cultured in six-well plates in 3 ml of serum-free RPMI 1640 (Life Technologies) supplemented with 100 U/ml penicillin and 100 μg/ml streptomycin for 24 h at 37°C and 5% CO2. Supernatants were centrifuged for 5 min at 16,060 × g at 4°C, collected, and stored at −80°C until analysis. To assess tissue pathology, scoring was performed using previously described scoring systems (12, 24). In brief, colons were fixed in 10% neutral formalin and embedded in paraffin. Then, 5-μm sections were prepared and stained with H&E. Two tissue sections from four to eight mice per group were assessed for submucosal edema (0 = no change; 1 = mild; 2 = moderate; 3 = profound), goblet cell depletion (scored based on numbers of goblet cells per field averaged from five fields at ×400 magnification, where 0 = >50; 1 = 26–50; 2 = 10–25; 3 = <10), epithelial hyperplasia (scored based on percentage above the height of the control, where 0 = no change; 1 = 1–50%; 2 = 51–100%; 3 = >100%), epithelial integrity (0 = no change; 1 = mild epithelial ulceration and crypt destruction; 2 = moderate epithelial ulceration and crypt destruction; 3 = severe epithelial ulceration with crypt destruction), and inflammatory cell infiltration (0 = occasional inflammatory cells in the lamina propria; 1 = increased number of inflammatory cells in the lamina propria; 2 = confluent inflammatory cells, extending into the submucosa; 3 = transmural extension of the infiltrate). Five-micrometer paraffin sections were deparaffinized and rehydrated. Ags were retrieved by soaking in preheated citrate buffer (pH 6) under microwave heating for 20 min. To quench endogenous peroxidase activity, sections were incubated with 3% H2O2 for 15 min. Sections were incubated with 5% BSA for 1 h at room temperature to block nonspecific binding sites and then were incubated with rabbit anti–C. rodentium Abs (7, 12–14). Subsequently, sections were incubated with EliVision plus kits (Maixin) at room temperature. After washing, DAB reagent was added to visualize stained proteins. The concentrations of IL-6, IL-1β, TNF-α (all from eBioscience, San Diego, CA), CXCL2 (R&D Systems) and CXCL5 (Abcam) were assayed using ELISA kits, according to the manufacturer’s instructions. Supernatants from cultured colons were standardized to the amount of total protein in the supernatant by quantification using the DC Protein Assay (Bio-Rad). Colonic epithelial cells and CMT93 cells were lysed in RIPA buffer (150 mM NaCl, 50 mM Tris, 0.1% SDS, 1 mM EDTA, 1% Triton X-100, 1 mM PMSF, and protease inhibitors). Proteins were quantified with a BCA assay. Equal amounts of proteins were loaded onto 8% SDS-PAGE gels and transferred onto polyvinylidene difluoride membranes (Millipore), followed by immunoblotting with anti–SRC-3, anti–p-p65, anti-p65, anti-IκBα (Cell Signaling Technology), and anti–β-actin (Sigma). Western blots were analyzed using a Tonen Imager. Colons were processed for myeloperoxidase (MPO) staining using Hanker-Yates reagent (Polysciences), according to the manufacturer’s instruction. MPO+ cells were counted under a microscope in five randomly chosen areas in each specimen at a magnification of ×400. Total RNA was extracted with TRIzol Reagent (Life Technologies) from cells or tissues, in accordance with the manufacturer’s instructions, and cDNA was synthesized with a ReverTra Ace qPCR RT Kit (TOYOBO). Real-time PCR was performed with FastStart Universal Probe Master (Rox) (Roche). Expression of each target gene was normalized to that of GAPDH. The sequences of primers used for quantitative real-time PCR will be provided on request. Epithelial and lamina propria cells were isolated from the lamina propria using a modification of a previously described protocol (25). In brief, mice were sacrificed, and colonic tissues were removed. The colons were washed in PBS containing 10,000 U/ml penicillin and 10 mg/ml streptomycin. Colons were cut longitudinally and washed three times in PBS containing penicillin and streptomycin. Tissue was cut into 0.5-cm pieces and incubated in PBS containing 2.5% FCS and 1 mM DTT (Sigma-Aldrich, St. Louis, MO) for 30 min at 37°C with gentle shaking to remove any mucus. The pieces were incubated twice in PBS containing 5 mM EDTA (Sigma-Aldrich) for 15 min each at 37°C with gentle shaking and washed three times with PBS. Epithelial cells were pooled from the supernatant after each round of rinsing and collected by centrifugation after passing through a nylon mesh strainer (100 μm pore size; BD). Collected epithelial cells were resuspended in 1 ml of TRIzol Reagent (Life Technologies) for further RNA extraction. Pieces of colons were washed for 10 min in RPMI 1640 to inactivate EDTA. Thereafter, pieces of colons were incubated in RPMI 1640 containing 5% FCS, 0.5 mg/ml collagenase (Sigma-Aldrich) for 2 h at 37°C with gentle shaking. Supernatants were filtered through a 40-μm nylon sieve, washed in RPMI 1640 containing 5% FCS, and centrifuged to pellet the cells. Cells were resuspended in RPMI 1640 containing 10% FCS, washed twice, and used immediately for flow cytometric analysis. Colonic macrophages were purified by positive selection with a magnetic cell separation system (MACS; Miltenyi Biotec, Auburn, CA) using anti-mouse CD11b MicroBeads (8). Cells isolated from the lamina propria or peritoneal cavity were treated on ice for 30 min with rat IgG (0.2 mg/ml) to block nonspecific binding to Fc receptors at 4°C. Thereafter, cells were incubated on ice for 30 min with fluorescently conjugated Abs for the following cell surface markers: PE-Cy5–conjugated anti-Gr1 mAb RB6-8C5, PE-conjugated anti-F4/80 mAb BM8, and FITC-conjugated anti-CD11b mAb M1/70 (all from eBioscience). Isotype controls consisted of PE-conjugated IgG2a, PE-Cy5–conjugated IgG2b, and FITC-conjugated IgG2b (all from eBioscience). Cells were washed and fixed in 1% paraformaldehyde overnight at 4°C. Analysis of stained cells was performed with a FACSCanto flow cytometer (BD Biosciences). Isotype controls were used to set appropriate gates. Data were analyzed with FACSDiva (BD Bioscience) and FlowJo 6.4.7 (Tree Star, Ashland, OR). For all samples, ∼10,000 cells were analyzed for plot generation. C. rodentium was inoculated into Luria–Bertani medium and cultured in a shaker for 12 h at 37°C. The bacteria were washed twice with PBS and resuspended in PBS. CMT93 cells were infected with C. rodentium at a multiplicity of infection of 200 by directly adding C. rodentium to DMEM, without spinning, for the indicated times at 37°C; 50 μg/ml gentamicin was added to limit the growth of extracellular bacteria. The CXCL2 promoter fragment −1227 to +14 was ligated into the KpnI and XhoI sites of the PGL3-basic vector to yield the CXCL2 reporter plasmid, using a method described previously (26). To produce site-specific mutation at NF-κB sites, the transcription factor recognition sites were abolished by a one-step site-directed and site-saturation mutagenesis method (27). The primers designed to introduce site-directed mutation were synthesized as follows: mNF-κB (−144), forward, 5′-CCCTGAGCTCAGtcgATTTCCCTGGTCCCCGGGCTTTTC-3′ and reverse, 5′-GACCAGGGAAATcgaCTGAGCTCAGGGTCCCCTCATCAGG-3′ and mNF-κB (−742), forward, 5′-TGGAAGAGCCTCatAAGTTCCAGAATTTCACAGAGG-3′ and reverse, 5′-ATTCTGGAACTTatGAGGCTCTTCCAGTGTGCTGGTG-3′. Lowercase letters indicate the mutated sites. As a result of these primers, we obtained the reporter constructs pCXCL2-M1-Luc, pCXCL2-M2-Luc, and pCXCL2-M1+M2-Luc. We used DNA sequencing to verify the nucleotide sequences of these constructs. Individual assays were normalized for Renilla luciferase activity, and the data are presented as a fold increase in activity relative to the empty vector control. Luciferase activity was assayed using the Dual-Luciferase Reporter Assay System (Promega, Madison, WI). CMT93 cells were used for the chromatin immunoprecipitation (ChIP) assay and were processed according to the method described by Abcam (Cambridge, MA). The following primers were used: CXCL2 promoter −742 NF-κB binding site, forward, 5′-CTCTTACAGCTGATGTGGTGCTC-3′ and reverse, 5′-GAGATGTGTCAAAAGCTTAATTC-3′ and CXCL2 promoter −144 NF-κB binding site, forward, 5′-AACCCACTCAGCTTAGGGGC-3′ and reverse, 5′-TTGTTGGAGGCACTGAGGC-3′. Anti–SRC-3 Ab was purchased from Santa Cruz Biotechnology (Santa Cruz, CA). The Mann–Whitney U test was used to analyze chemokine production and bacterial counts of infected mice in vivo. All other statistical significance was determined by the two-tailed t test using GraphPad Prism 5. Differences were considered significant at p values < 0.05. All data are expressed as mean + SEM or mean + SD. In SRC-3−/− mice, the lacZ coding sequence was fused to the 10th amino acid of SRC-3 to allow the endogenous SRC-3 promoter to control lacZ expression (21). Therefore, we could perform X-gal staining to investigate SRC-3 expression patterns in the colons of SRC-3−/− mice. As shown in Fig. 1A, without C. rodentium infection, SRC-3 expression was primarily detected in colon enterocytes of SRC-3−/− mice, as indicated by X-gal staining (blue); after intestinal C. rodentium infection for 7 or 14 d, SRC-3 expression was detected in most colonic epithelial cells, suggesting that SRC-3 in colonic epithelial cells can be induced by C. rodentium infection. Consistently, Western blot analysis showed that SRC-3 expression was significantly upregulated in colonic epithelial cells isolated from SRC-3+/+ mice 7–14 d after intestinal C. rodentium infection (Fig. 1B). These results demonstrate that the increase in SRC-3 in colonic epithelial cells after C. rodentium infection was due to an increase in SRC-3+ epithelial cell number and an increase on a per-cell basis. Because colonic epithelial cells are target cells of C. rodentium, upregulation of SRC-3 expression in colonic epithelial cells after C. rodentium infection indicates that SRC-3 in colonic epithelial cells may be involved in the host defense against C. rodentium infection. SRC-3 is highly expressed in colonic epithelial cells and upregulated in response to C. rodentium infection. (A) SRC-3 was highly expressed in colonic epithelial cells and further upregulated in response to C. rodentium infection. Sections of frozen colon tissues from SRC-3+/+ (n = 4) and SRC-3−/− mice (n = 4) were stained with X-gal. Scale bars, 50 μm. Arrows indicate representative positive-staining cells (blue). (B) SRC-3 was upregulated in colonic epithelial cells in response to C. rodentium infection. The protein levels of SRC-3 in colonic epithelial cells of uninfected wild-type mice or wild-type mice infected with C. rodentium for 7 and 14 d were detected by Western blot analysis. Results are representative of three independent experiments. To assess the role of SRC-3 in the host defense against C. rodentium, we infected wild-type and SRC-3−/− mice with C. rodentium orally and monitored the numbers of pathogenic bacteria in the feces, colons, spleens, and livers for up to 28 d. As shown in Fig. 2A, C. rodentium in the feces of wild-type mice reached maximum levels (108 CFU/g) on days 7–12 and then declined over time to become almost undetectable by day 21 postinfection. In contrast, although the numbers of C. rodentium in the feces of SRC-3−/− mice reached maximum levels on days 7–12, similar to in wild-type mice, they decreased much more slowly than in wild-type mice (Fig. 2A). Similar changes in bacterial number were observed in the colons, livers, and spleens (Fig. 2B–D). 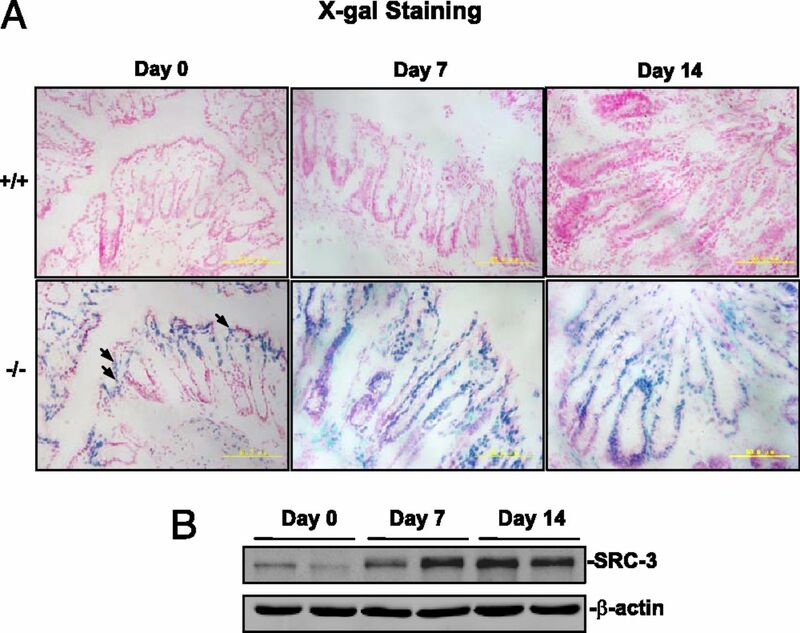 Immunohistochemical staining of C. rodentium in the colons of wild-type and SRC-3−/− mice confirmed the change in bacterial number in the colons (Fig. 2E). These results indicate that SRC-3 deficiency does not affect the expansion and systemic spreading of C. rodentium during the early phase of infection, but it severely impairs its clearance during the late phase of infection. Delayed clearance of C. rodentium by SRC-3−/− mice. Bacterial numbers in feces (A), colon (B), liver (C), and spleen (D) from wild-type or SRC-3−/− mice infected orally with C. rodentium were determined by CFU assays at the indicated times postinfection. The dashed horizontal lines represent the detection limit. Data are mean + SEM (n = 5–10). Results are representative of two independent experiments. (E) Localization of C. rodentium in the colons of wild-type and SRC-3−/− mice by immunohistochemical staining. Images are representative of three separate experiments, n = 4–5 per group. Scale bars, 100 μm. Arrows indicate immunopositive signals. *p < 0.05, **p < 0.01. Oral infection with C. rodentium induces inflammation and colonic pathology that is characterized by inflammatory cell infiltration, hyperplasia, disruption of epithelial cells, submucosa edema, and goblet cell depletion (23). We performed H&E staining to assess C. rodentium–induced colonic pathology in SRC-3−/− mice and wild-type mice. In the absence of C. rodentium infection, SRC-3−/− mice and wild-type mice did not exhibit any colonic pathology (Fig. 3). 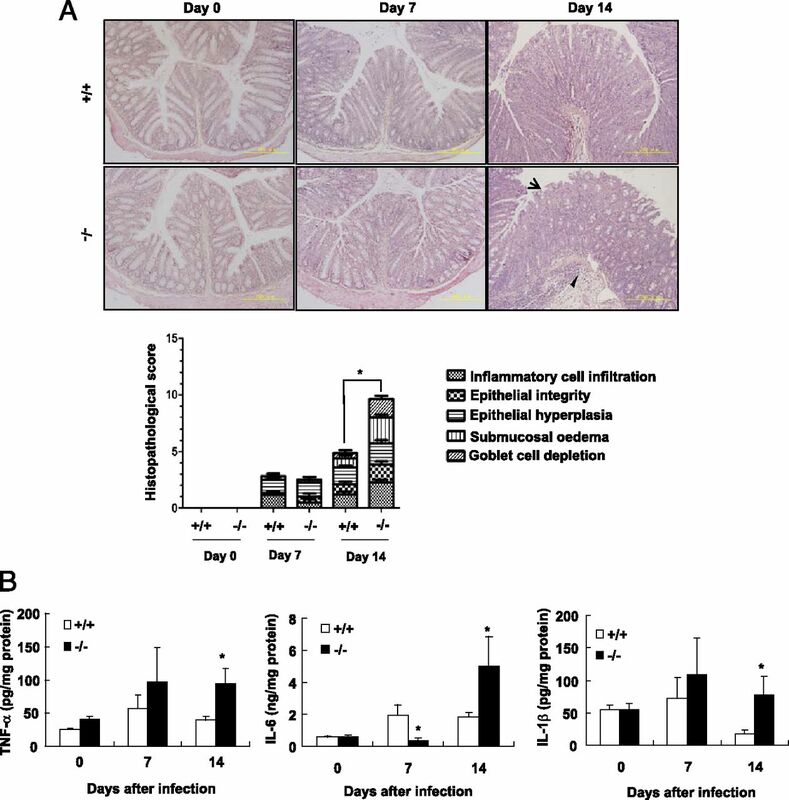 On day 7 postinfection, SRC-3−/− and wild-type mice showed a comparable mild colonic pathology that was characterized by increased inflammatory cell infiltration, disruption of epithelial integrity, epithelial hyperplasia, submucosal edema, and goblet cell depletion; however, on day 14 postinfection, SRC-3−/− mice exhibited more severe colonic pathology than did wild-type mice (Fig. 3A). These results indicate that SRC-3 can protect mice from C. rodentium–induced colonic pathology during the late phase of infection. SRC-3−/− mice display more severe colonic pathology compared with wild-type mice after C. rodentium infection. (A) H&E staining of colon from uninfected or infected wild-type and SRC-3−/− mice (upper panels). Scale bars, 100 μm. Arrowhead and arrow denote marked submucosal inflammatory cellular infiltrates/edema and epithelial damage/inflammation in the mucosa, respectively (original magnification ×200). Histopathological scores of wild-type and SRC-3−/− mice at day 0 and at days 7 and 14 postinfection (lower panel). Data are mean + SEM (n = 4–10). (B) The expression of inflammatory cytokines was higher in the colon of SRC-3−/− mice on day 14 after C. rodentium infection. Data are mean + SEM (n = 4–10). Results are representative of two independent experiments. *p < 0.05. Furthermore, we measured the levels of proinflammatory cytokines after oral infection with C. rodentium. The mRNA levels of IL-22, IL-17A, and IFN-γ were comparable in the colons of wild-type and SRC-3−/− mice on day 0 and on days 7 and 14 after C. rodentium infection (data not shown). The concentrations of TNF-α and IL-1β were comparable in the colons of wild-type and SRC-3−/− mice on day 0 and on day 7 postinfection (Fig. 3B), whereas the concentrations of IL-6 in the colons of wild-type mice were higher compared with SRC-3−/− mice on day 7 postinfection (Fig. 3B). However, on day 14 postinfection, the concentrations of TNF-α, IL-6, and IL-1β in the colons of SRC-3−/− mice were significantly higher compared with wild-type mice (Fig. 3B), indicating that SRC-3−/− mice suffer more severe colonic inflammation during the late phase of C. rodentium infection. Antimicrobial genes, such as the Reg family of antimicrobial proteins, cathelicidin-related antimicrobial peptide, and β-defensins, play important roles in host defense against C. rodentium (15, 28, 29). To determine whether SRC-3 protects mice from C. rodentium infection by regulating the expression of antimicrobial genes, we analyzed the expression of some antimicrobial genes involved in host defense against C. rodentium in the colons of SRC-3−/− mice and wild-type mice. As shown in Supplemental Fig. 1, SRC-3 deficiency did not impair the expression of Reg3β, Reg3γ, cathelicidin-related antimicrobial peptide, defensinβ1, defensinβ3, or defensinβ4 in the colons of mice infected by C. rodentium, indicating that impaired clearance of C. rodentium in SRC-3−/− mice is not due to defects in the expression of antimicrobial genes. Because neutrophils and monocytes/macrophages are important for promoting bacterial eradication in the colon, we used flow cytometry to assess the influx of neutrophils and monocytes in the colon lamina propria of SRC-3−/− mice and wild-type mice after oral infection with C. rodentium. Lamina propria cells were stained for the macrophage marker F4/80; the leukocyte marker CD11b, which is shared among macrophages, neutrophils, and some dendritic cells; and Gr1, which is expressed in neutrophils, inflammatory macrophages, and some populations of dendritic cells (30). In the absence of C. rodentium infection, the number of neutrophils (CD11b+F4/80−Gr1hi) was comparable in the colons of SRC-3−/− mice and wild-type mice (Fig. 4A, 4B). On day 7 after C. rodentium infection, significantly more neutrophils were recruited to the colons of wild-type mice (1.7%) compared with SRC-3−/− mice (0.5%) (Fig. 4A, 4B). However, on day 14 after C. rodentium infection, the influx of neutrophils to the colons of wild-type mice was decreased to 0.5%, whereas the influx of neutrophils to the colons of SRC-3−/− mice was increased to 1.4% (Fig. 4A, 4B). The numbers of CD11b+F4/80+Gr-1hi inflammatory macrophages were comparable in the colons of SRC-3−/− mice and wild-type mice during C. rodentium infection (Fig. 4C). These results indicate that SRC-3 deficiency causes a delay in neutrophil recruitment to the colon but has no effect on the recruitment of monocytes to the colon in response to C. rodentium infection. Recruitment of CD11b+F4/80−Gr-1hi neutrophils to the colons is delayed in SRC-3−/− mice after C. rodentium infection. (A) Cells were isolated from the colon of wild-type and SRC-3−/− mice on day 0 and on days 7 and 14 postinfection and stained for CD11b, F4/80, and Gr-1 mAb. CD11b+F4/80− cells (total fraction) were gated, and the percentage of CD11b+F4/80−Gr-1hi cells in the gated population was determined. (B) Quantitation of CD11b+F4/80−Gr-1hi neutrophils in the colons of wild-type and SRC-3−/− mice on day 0 and on days 7 and 14 postinfection (n = 4–5). 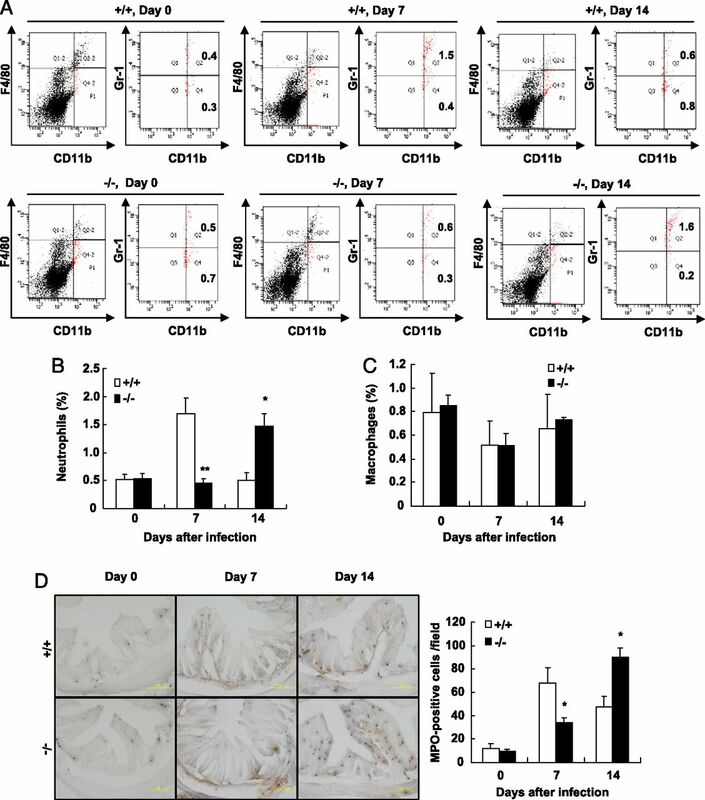 (C) Quantitation of CD11b+F4/80+Gr-1hi inflammatory macrophages in the colons of wild-type and SRC-3−/− mice on day 0 and on days 7 and 14 postinfection (n = 4–5). (D) Examination and quantitation of MPO+ neutrophils. Frozen sections of colon were prepared and stained with Hanker-Yates regent (original magnification ×200; left panels). Scale bars, 100 μm. Brown signal denotes MPO+ cells. Quantitation of MPO+ cells (right panel). Data are mean + SEM (n = 5). Results are representative of two independent experiments. *p < 0.05, **p < 0.01. Furthermore, histochemistry staining of neutrophils (MPO+ cells) confirmed the results of flow cytometry (Fig. 4D). These results suggest that SRC-3 plays an important role in the recruitment of neutrophils to the colon in response to C. rodentium infection. Chemokines drive the recruitment of immune cells, such as neutrophils, monocytes, and lymphocytes, which are required for clearing C. rodentium in response to bacterial infection (31, 32). CXCL1, CXCL2, and CXCL5 are chemokines involved in neutrophil recruitment and are highly induced upon C. rodentium infection (33). Therefore, we investigated the expression of these chemokines and their receptor CXCR2 in the colons of SRC-3−/− and wild-type mice upon C. rodentium infection (Fig. 5). The expression levels of CXCL1 and CXCR2 mRNAs were comparable in the colons of SRC-3−/− and wild-type mice on day 0 and on days 7 and 14 after C. rodentium infection (Fig. 5A, 5B). On day 7 postinfection, the mRNA levels of CXCL2 and CXCL5 were significantly increased in the colons of wild-type mice compared with SRC-3−/− mice (Fig. 5C, 5D). Interestingly, on day 14 postinfection, when the mRNA expression of CXCL2 and CXCL5 had decreased in the colons of wild-type mice, the mRNA expression of CXCL2 and CXCL5 was significantly increased in the colons of SRC-3−/− mice (Fig. 5C, 5D). In addition, the expression pattern of colonic proteins CXCL2 and CXCL5 was consistent with the expression pattern of their mRNAs (Fig. 5E, 5F). These results indicate that SRC-3 deficiency causes a delayed induction in the expression of CXCL2 and CXCL5 in the colon in response to C. rodentium infection. 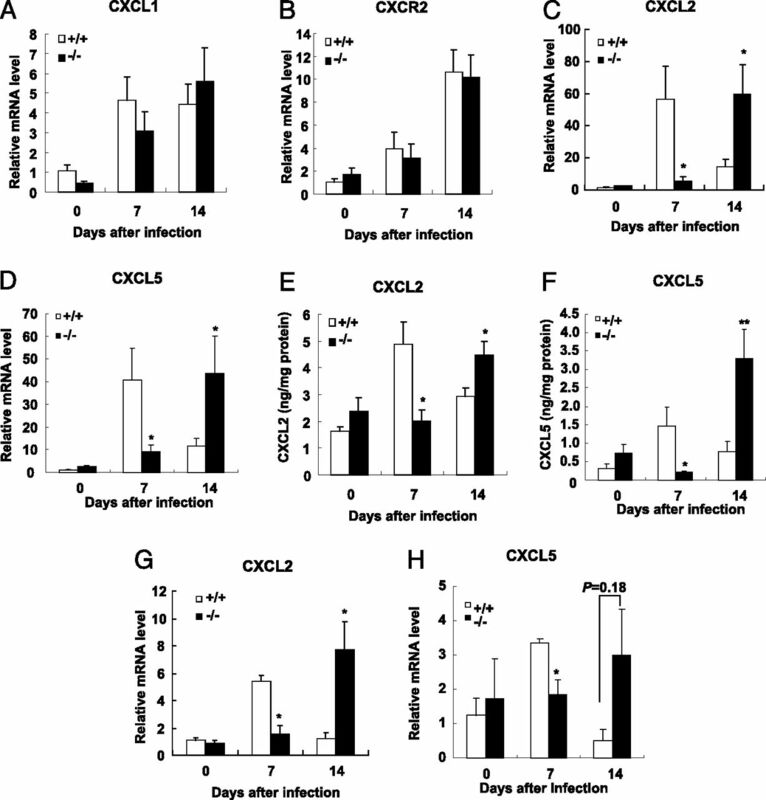 Induction of colonic CXCL2 and CXCL5 is delayed in SRC-3−/− mice after C. rodentium infection. Quantitative RT-PCR of CXCL1 (A), CXCR2 (B), CXCL2 (C), and CXCL5 (D) in the distal colons of wild-type and SRC-3−/− mice after C. rodentium infection. Data are mean + SEM (n = 8–13). Quantitation of the protein levels of CXCL2 (E) and CXCL5 (F) in colon. Colons from wild-type and SRC-3−/− mice were cultured for 24 h, and colon supernatants were analyzed for protein levels of CXCL2 and CXCL5 by ELISA and standardized to levels of total protein. Data are mean + SEM (n = 8–13). Quantitative RT-PCR of CXCL2 (G) and CXCL5 (H) in isolated colonic epithelial cells of wild-type and SRC-3−/− mice after C. rodentium infection. Data are mean + SEM (n = 4–5). Results are representative of two independent experiments. *p < 0.05, **p < 0.01. Because SRC-3 is primarily expressed in colonic epithelial cells (Fig. 1A), and CXCL2 and CXCL5 from colonic epithelial cells play an essential role in neutrophil recruitment after C. rodentium infection, we wondered whether the expression of CXCL2 and CXCL5 in colonic epithelial cells is affected by SRC-3 deficiency. We isolated epithelial cells from the colons of SRC-3−/− and wild-type mice on day 0 and on days 7 and 14 after C. rodentium infection and measured the expression of CXCL2 and CXCL5 by real-time PCR. As shown in Fig. 5G, when CXCL2 expression in colonic epithelial cells from wild-type mice was induced on day 7 after C. rodentium infection, it remained unchanged in SRC-3−/− mice; however, when CXCL2 expression in colonic epithelial cells from wild-type mice was reduced to near basal levels, it was significantly induced in colonic epithelial cells of SRC-3−/− mice on day 14 after C. rodentium infection. Compared with CXCL2 mRNA expression, similar changes in CXCL5 mRNA expression were also observed in colonic epithelial cells during C. rodentium infection (Fig. 5H). We also isolated macrophages from colons on day 7 after C. rodentium infection using a magnetic cell separation system with anti-mouse CD11b microbeads and measured the mRNA expression of CXCL1, CXCL2, and CXCL5. The mRNA levels of CXCL1, CXCL2, and CXCL5 in macrophages were comparable in the colons of wild-type mice and SRC-3−/− mice on day 7 postinfection (data not shown). These results indicate that SRC-3 deficiency in colonic epithelial cells causes a delayed induction of CXCL2 and CXCL5 during C. rodentium infection. Because the expression of CXCL2 and CXCL5 was reduced in SRC-3−/− colonic epithelial cells, it may be regulated by SRC-3 in colonic epithelial cells. To determine whether SRC-3 can regulate the expression of CXCL2 and CXCL5 in the mouse colon cancer cell line CMT93, we transfected SRC-3–specific small interfering RNA to knock down SRC-3 in CMT93 cells and examined the effects of SRC-3 knockdown on the expression of CXCL2 and CXCL5 in response to C. rodentium infection. As shown in Fig. 6A, C. rodentium infection induced a 7-fold increase in CXCL2 expression in control CMT93 cells, whereas the induction of CXCL2 expression was reduced significantly in SRC-3–knockdown CMT93 cells. However, the induction of CXCL5 was not affected by SRC-3 knockdown (Fig. 6A). 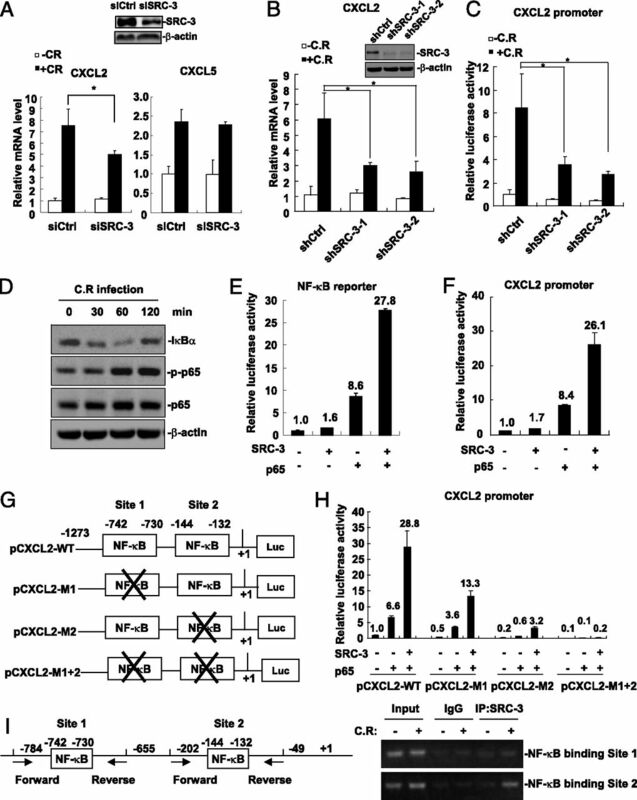 The impairment of CXCL2 induction by C. rodentium infection was also observed in two SRC-3–knockdown stable CMT93 cell lines (shSRC-3-1 and shSRC-3-2) (Fig. 6B). The numbers of C. rodentium attached to control and SRC-3–knockdown CMT93 cells at 2 h postinfection were comparable (Supplemental Fig. 2A), ruling out the possibility that the difference in CXCL2 expression is due to reduced bacterial attachment to SRC-3–knockdown cells. SRC-3 regulates the expression of CXCL2 in CMT93 cells via enhancing NF-κB signaling. (A) siSRC-3–mediated knockdown of SRC-3 in CMT93 cells reduced C. rodentium–induced CXCL2 expression but not CXCL5 expression. Data are mean + SD (n = 3). (B) C. rodentium–induced CXCL2 expression was reduced in two SRC-3–knockdown stable CMT93 cell lines (shSRC-3-1 and shSRC-3-2). Data are mean + SD (n = 3). (C) CXCL2 promoter activity was decreased in shSRC-3-1 and shSRC-3-2 CMT93 cells infected with C. rodentium for 6 h at a multiplicity of infection of 200. Data are mean + SD (n = 3). (D) C. rodentium infection induced IκBα degradation and p65 phosphorylation. (E) SRC-3 cooperated with p65 to enhance the activity of the NF-κB reporter. (F) SRC-3 cooperated with p65 to enhance the activity of the CXCL2 reporter. (G) Schematic representation of the CXCL2 promoter. Two NF-κB binding sites are shown. X denotes mutation of the NF-κB binding site. (H) Mutation analysis of the role of two NF-κB binding sites in NF-κB–mediated activation of the CXCL2 promoter. CMT93 cells were transfected with control or mutated CXCL2 promoter, SRC-3 expression plasmids, and p65 expression plasmids. CXCL2 promoter activity was assayed at 24 h posttransfection. Data are mean + SD (n = 3). (I) SRC-3 was recruited to the CXCL2 promoter upon C. rodentium infection. Positions of the subfragments detected in ChIP assays (left panel). ChIP assay showed that SRC-3 was recruited to the CXCL2 promoter upon C. rodentium infection (right panel). *p < 0.05. C.R, C. rodentium; shCtrl, negative control short hairpin RNA; siCtrl, negative control small interfering RNA. Furthermore, we examined whether SRC-3 could promote CXCL2 transcription by transfecting the CXCL2 promoter/reporter into control and SRC-3–knockdown CMT93 cells. As shown in Fig. 6C, C. rodentium infection induced CXCL2 promoter activity 8-fold in control CMT93 cells, whereas the induction of CXCL2 promoter activity was significantly reduced in SRC-3–knockdown CMT93 cells. These results suggest that SRC-3 can promote CXCL2 expression at the transcriptional levels. It was reported that CXCL2 expression can be induced by NF-κB (34). Given that C. rodentium could attach to CMT93 cells (Supplemental Fig. 2B) to induce NF-κB activation, as demonstrated by the induction of IκBα degradation and the phosphorylation of the p65 subunit of NF-κB (Fig. 6D), and that SRC-3 could interact with p65 (Supplemental Fig. 3) to enhance p65-mediated activation of NF-κB reporter (Fig. 6E), we hypothesized that SRC-3 could enhance NF-κB–induced CXCL2 expression. To test this hypothesis, we transfected CMT93 cells with the CXCL2 promoter/reporter with the expression vectors of SRC-3, p65, and both SRC-3 and p65, respectively. Transfection of p65 induced CXCL2 promoter activity 8.4-fold in CMT93 cells (Fig. 6F), indicating that CXCL2 transcription can be activated by NF-κB as expected. Although transfection of SRC-3 only induced CXCL2 promoter activity 1.7-fold, cotransfection of SRC-3 and p65 dramatically induced CXCL2 promoter activity 26-fold, suggesting that SRC-3 can enhance NF-κB–induced CXCL2 expression. There are two NF-κB binding sites on the CXCL2 promoter (Fig. 6G). We performed mutation analysis to determine the role of these binding sites in NF-κB–mediated activation of the CXCL2 promoter. As shown in Fig. 6H, cotransfection of SRC-3 and p65 induced the activity of wild-type CXCL2 promoter (CXCL2-WT) 28.8-fold, but it only induced the promoter activity of Site 1–mutated (CXCL2-M1), Site 2–mutated (CXCL2-M2), and Site 1/2–double mutated (CXCL2-M1+2) 13.3-, 3.2-, and 0.2-fold, respectively, suggesting that both NF-κB binding sites contribute to the NF-κB–mediated activation of the CXCL2 promoter but that the NF-κB binding Site 2 plays a major role. We next determined whether SRC-3 can be recruited to the NF-κB binding sites on the CXCL2 promoter after NF-κB activation by C. rodentium infection. As shown in Fig. 6I, SRC-3 primarily bound to NF-κB binding Site 2 after C. rodentium infection, suggesting that SRC-3 is mainly recruited to NF-κB binding Site 2 to enhance NF-κB–mediated activation of the CXCL2 promoter upon C. rodentium infection. In this study, we showed that SRC-3−/− mice exhibited increased intestinal C. rodentium load and more severe intestinal inflammation and pathology after oral infection with C. rodentium compared with wild-type mice. A/E pathogens, including EPEC and C. rodentium, use A/E lesions to colonize the intestine of host and use virulence factors, such as EspF, to induce epithelial cell death and then cause epithelial barrier breakdown (35). In addition, C. rodentium infection can trigger host Th1 immune responses to induce immune-driven injury of intestinal tissue (36, 37). Therefore, more enteric bacteria in SRC-3−/− mice on day 14 after C. rodentium infection could cause more severe intestinal inflammation and more serious intestinal tissue damage. C. rodentium infection can be divided into two phases: the early phase (before 8 d after C. rodentium infection) and the late phase (between 8 and 16 d after C. rodentium infection) (38). Neutrophils play an important role in immunity to infection by ingesting and killing invading pathogens, as well as by the formation of neutrophil extracellular traps, which is an alternative to death by necrosis or apoptosis (39, 40). Depletion of neutrophils with specific Ly6G Ab results in increased bacteria burden, increased colon pathology, and accelerated mortality during the early phase of C. rodentium infection, indicating that neutrophils are necessary for the early innate phase of the mucosal immune response (6, 7). In this study, we found when intestinal bacterial burden was rapidly increased on day 7 after C. rodentium infection in wild-type and SRC-3−/− mice, the recruitment of neutrophils into colonic lamina propria of SRC-3−/− mice was impaired compared with wild-type mice. Therefore, impaired intestinal neutrophil recruitment in SRC-3−/− mice during the early phase of C. rodentium infection may be responsible for the increased bacterial burden and severe tissue pathology on day 14 after C. rodentium infection. Interestingly, the recruitment of intestinal neutrophils in SRC-3−/− mice could be resumed on day 14 after C. rodentium infection, resulting in infection control after that time. In general, SRC-3 deficiency causes delayed intestinal neutrophil recruitment and a corresponding delayed control of C. rodentium infection. Neutrophil recruitment is driven by chemokines, such as CXCL1, CXCL2, and CXCL5 (41). The lack of proper chemokine expression is often associated with impaired neutrophil recruitment. In this study, we found that induction of CXCL2 and CXCL5 in the colons and colonic epithelial cells of SRC-3−/− mice was impaired during the early phase of C. rodentium infection but resumed during the late phase of C. rodentium infection compared with wild-type mice. These results suggest that the expression of CXCL2 and CXCL5 is dependent on SRC-3 during the early phase of C. rodentium infection but is independent of SRC-3 during the late phase of infection. The expression pattern of CXCL2 and CXCL5 is correlated with the pattern of neutrophil recruitment in wild-type and SRC-3−/− mice, indicating that they play essential roles in neutrophil recruitment during the early phase of C. rodentium infection. During C. rodentium infection, colonic epithelial CXCL2 expression can be induced by NF-κB signaling activated by C. rodentium via pattern recognition receptors (24, 42) or by lymphotoxin via lymphotoxin β receptor (7). It is known that SRC-3 can serve as a coactivator for NF-κB to enhance its transcriptional activity (43, 44). Our results showed that SRC-3 could be recruited to the NF-κB binding site on the NF-κB promoter and that SRC-3 could cooperate with NF-κB to enhance CXCL2 transcription, suggesting that SRC-3 regulates CXCL2 expression at the transcriptional level, at least in part through activating NF-κB signaling. Intriguingly, although induction of CXCL2 expression in the colon of SRC-3−/− mice was impaired on day 7 after C. rodentium infection, its induction in the colons of SRC-3−/− mice could be resumed on day 14 after C. rodentium infection, indicating that induction of CXCL2 expression in the colons of SRC-3−/− mice on day 14 after C. rodentium infection is independent of SRC-3. Possible explanations are that more severe inflammation and tissue damage in the colons of SRC-3−/− mice on day 14 after C. rodentium infection may induce stronger NF-κB signaling or that induction of other SRC family members, such as SRC-1 (Supplemental Fig. 4A), which can also cooperate with NF-κB to enhance CXCL2 expression (Supplemental Fig. 4B, 4C), may compensate for SRC-3 function. Although the induction of CXCL5 in colonic epithelial cells of SRC-3−/− mice was impaired during the early phase of C. rodentium infection, siSRC-3–mediated knockdown of SRC-3 did not reduce C. rodentium–induced CXCL5 expression in the mouse colon cancer cell line CMT93. The inconsistency could be explained by several possibilities: to some extent, the characteristics of colonic epithelial cells are different from CMT93 cells, so the effect of SRC-3 on C. rodentium–induced CXCL5 expression in colonic epithelial cells cannot be mimicked in CMT93 cells; some factors needed for SRC-3 to enhance C. rodentium–induced CXCL5 expression in colonic epithelial cells in vivo are absent in vitro; and the siSRC-3–mediated knockdown of SRC-3 in CMT93 cells is not sufficient to reduce C. rodentium–induced CXCL5 expression, although it is sufficient to reduce C. rodentium–induced CXCL2 expression. Further studies are needed to reveal the mechanism by which SRC-3 deficiency affects C. rodentium–induced CXCL5 expression in vivo. Although we observed a significant difference in the expression of colonic CXCL2 and CXCL5 in wild-type and SRC-3−/− mice at days 7 and 14 after C. rodentium infection, the expression of colonic CXCR2 was comparable in these mice. In addition to neutrophils, it was shown that CXCR2 is expressed in T lymphocytes and mast cells (45), which are also required for C. rodentium clearance (46, 47). T cells, such as CD4+ T cells and Th22 cells, play a critical role in C. rodentium clearance during the late phase of infection with C. rodentium (48). In light of these studies, it will be interesting to determine whether the differential expression of colonic CXCL2 and CXCL5 in wild-type and SRC-3−/− mice affects the function of T cells during the late phase of C. rodentium infection. We reported previously that SRC-3−/− mice were more susceptible to E. coli–induced septic peritonitis as a result of an overwhelming uncontrolled inflammation and a defect in bacterial clearance (20). The defect in bacterial clearance is due, at least in part, to the decreased E. coli phagocytosis by SRC-3−/− macrophages and increased SRC-3−/− macrophage apoptosis, indicating that SRC-3 exerts its antibacterial function by enhancing bacterial phagocytosis and macrophage survival during peritoneal E. coli infection. In this study, we showed that SRC-3 exerted its antibacterial function by recruiting neutrophils via upregulation of CXCL2 expression during intestinal C. rodentium infection. Therefore, our studies demonstrate that SRC-3 can exert its antibacterial function via different mechanisms in the face of different bacterial infections, highlighting its important role in host defense against bacterial infection. This work was supported by the National Natural Science Foundation of China (Grant 31170819 to C.Y. ), the National Basic Research Program of China (973 Program, Grant 2015CB553800 to C.Y. ), and the Institute Merieux (Grant 17102012 to C.Y.). J.X. was supported in part by National Institutes of Health Grants CA112403 and CA193455.
. 2005. Attaching-effacing bacteria in animals. J. Comp. Pathol. 132: 1–26.
. 2004. Pathogenic Escherichia coli. Nat. Rev. Microbiol. 2: 123–140.
. 1998. Escherichia coli O157:H7. Lancet 352: 1207–1212.
. 1998. Diarrheagenic Escherichia coli. Clin. Microbiol. Rev. 11: 142–201.
. 2005. Citrobacter rodentium of mice and man. Cell. Microbiol. 7: 1697–1706.
. 2007. TLR signaling mediated by MyD88 is required for a protective innate immune response by neutrophils to Citrobacter rodentium. J. Immunol. 179: 566–577.
. 2010. Lymphotoxin beta receptor signaling in intestinal epithelial cells orchestrates innate immune responses against mucosal bacterial infection. Immunity 32: 403–413.
. 2011. The Nod2 sensor promotes intestinal pathogen eradication via the chemokine CCL2-dependent recruitment of inflammatory monocytes. Immunity 34: 769–780.
. 2013. Intestinal monocytes and macrophages are required for T cell polarization in response to Citrobacter rodentium. J. Exp. Med. 210: 2025–2039.
. 2004. Clearance of Citrobacter rodentium requires B cells but not secretory immunoglobulin A (IgA) or IgM antibodies. Infect. Immun. 72: 3315–3324.
. 2006. CD4+-T cell effector functions and costimulatory requirements essential for surviving mucosal infection with Citrobacter rodentium. Infect. Immun. 74: 673–681.
. 2010. Epithelial p38alpha controls immune cell recruitment in the colonic mucosa. PLoS Pathog. 6: e1000934.
. 2013. Short-chain fatty acids activate GPR41 and GPR43 on intestinal epithelial cells to promote inflammatory responses in mice. Gastroenterology 145: 396–406.e1–10.
. 2013. Endothelial PAS domain protein 1 activates the inflammatory response in the intestinal epithelium to promote colitis in mice. Gastroenterology 145: 831–841.
. 2010. Muc2 protects against lethal infectious colitis by disassociating pathogenic and commensal bacteria from the colonic mucosa. PLoS Pathog. 6: e1000902.
. 2009. Normal and cancer-related functions of the p160 steroid receptor co-activator (SRC) family. Nat. Rev. Cancer 9: 615–630.
. 2012. Steroid receptor coactivator-3 differentially regulates the inflammatory response in peritoneal macrophages. Mol. Med. Rep. 5: 1099–1105.
. 2007. An essential function of the SRC-3 coactivator in suppression of cytokine mRNA translation and inflammatory response. Mol. Cell 25: 765–778.
. 2010. Steroid receptor coactivator 3 is required for clearing bacteria and repressing inflammatory response in Escherichia coli–induced septic peritonitis. J. Immunol. 185: 5444–5452.
. 2000. The steroid receptor coactivator SRC-3 (p/CIP/RAC3/AIB1/ACTR/TRAM-1) is required for normal growth, puberty, female reproductive function, and mammary gland development. Proc. Natl. Acad. Sci. USA 97: 6379–6384.
. 2001. IL-1 beta -converting enzyme (caspase-1) in intestinal inflammation. Proc. Natl. Acad. Sci. USA 98: 13249–13254.
. 2008. Toll-like receptor 2 plays a critical role in maintaining mucosal integrity during Citrobacter rodentium–induced colitis. Cell. Microbiol. 10: 388–403.
. 2006. Toll-like receptor 4 contributes to colitis development but not to host defense during Citrobacter rodentium infection in mice. Infect. Immun. 74: 2522–2536.
. 2005. Sp1-associated activation of macrophage inflammatory protein-2 promoter by CpG-oligodeoxynucleotide and lipopolysaccharide. Cell. Mol. Life Sci. 62: 188–198.
. 2004. An efficient one-step site-directed and site-saturation mutagenesis protocol. Nucleic Acids Res. 32: e115.
. 2006. Migratory fate and differentiation of blood monocyte subsets. Immunobiology 211: 609–618.
. 2002. Chemokines in rapid leukocyte adhesion triggering and migration. Semin. Immunol. 14: 83–92.
. 2012. Innate immune signaling in defense against intestinal microbes. Immunol. Rev. 245: 113–131.
. 2009. CXCR2-dependent mucosal neutrophil influx protects against colitis-associated diarrhea caused by an attaching/effacing lesion-forming bacterial pathogen. J. Immunol. 183: 3332–3343.
. 2003. NF-kappaB and c-Jun-dependent regulation of macrophage inflammatory protein-2 gene expression in response to lipopolysaccharide in RAW 264.7 cells. Mol. Immunol. 40: 633–643.
. 2001. Translocated EspF protein from enteropathogenic Escherichia coli disrupts host intestinal barrier function. J. Clin. Invest. 107: 621–629.
. 1999. Citrobacter rodentium infection in mice elicits a mucosal Th1 cytokine response and lesions similar to those in murine inflammatory bowel disease. Infect. Immun. 67: 3031–3039. 2012. IL-22 from T cells: better late than never. Immunity 37: 952–954. 2007. Neutrophils and intracellular pathogens: beyond phagocytosis and killing. Trends Microbiol. 15: 87–92. 2010. Neutrophils, from marrow to microbes. Immunity 33: 657–670.
. 2013. Mast cell and macrophage chemokines CXCL1/CXCL2 control the early stage of neutrophil recruitment during tissue inflammation. Blood 121: 4930–4937.
. 2000. RAC-3 is a NF-kappa B coactivator. FEBS Lett. 485: 195–199.
. 2002. Regulation of SRC-3 (pCIP/ACTR/AIB-1/RAC-3/TRAM-1) coactivator activity by I kappa B kinase. Mol. Cell. Biol. 22: 3549–3561.
. 2004. Human T lymphocytes and mast cells differentially express and regulate extra- and intracellular CXCR1 and CXCR2. Exp. Dermatol. 13: 520–525.
. 2003. Central role for B lymphocytes and CD4+ T cells in immunity to infection by the attaching and effacing pathogen Citrobacter rodentium. Infect. Immun. 71: 5077–5086.
. 2005. Mast cells limit systemic bacterial dissemination but not colitis in response to Citrobacter rodentium. Infect. Immun. 73: 1978–1985.
. 2012. Th22 cells are an important source of IL-22 for host protection against enteropathogenic bacteria. Immunity 37: 1061–1075.